Ah, my home area of High Blantyre. This section of the 1747 map is perhaps the most populated. Of all the 500 people or so living in Blantyre in 1747, most of them lived around the area of Kirkton, Auchinraith and Barnhill. The first thing anybody will notice about this map (with man made objects shown in red) is there is a defined cluster of homes and people centered around Kirkton and at the junction of Bardykes Road at Barnhill. The Church was then located in the middle of the current kirkyard at Main Street with roads spiraling outwards North at Hunthill Road, North East to School Lane and to the East at Priestfield and Main Street. You may have noticed already that the top cross, wasn’t actually a cross at this time with Main Street very different from it is today. You wouldn’t be able to go along main street and come out at the kirkyard, you ended up at Priestfield and had to go north to get to the Kirkyard! The Main Street or at least part of it had a very different profile from Causeystanes to where Auchinraith is today, more centered around Bellsfield with no sign of the current Main Street we know today near Cemetery road along to Auchinraith. On the later 1859 map, the old road profile is shown as a field boundary, with the modern road we know today formed by then. 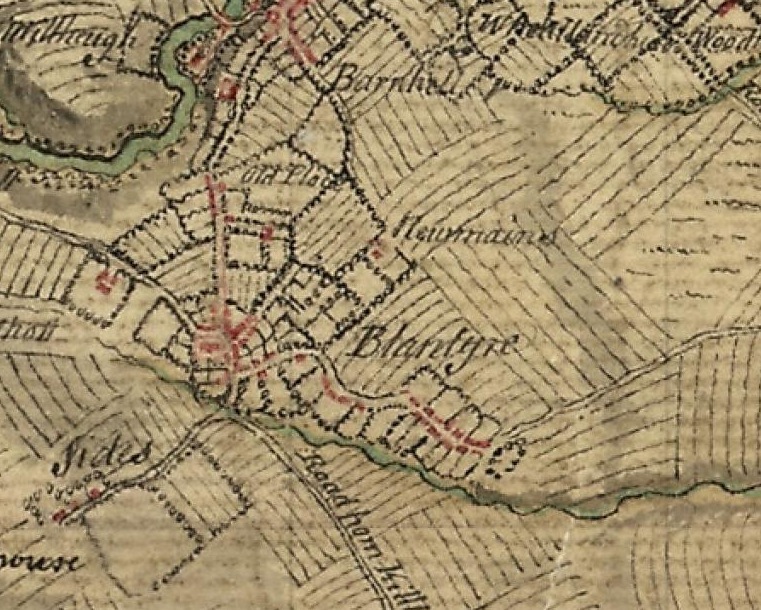 In the middle of this 1747 map, Old Place is shown (later to become Old Mains or in recent times The Coach House). Across the fields was Newmains, later to become known as Broompark.